Ions such as calcium, magnesium and iron coat the surfaces they come into contact with, forming scale and causing discolouration, which damages pipework and stains equipment. Certain contaminants, including lead, mercury and other heavy metals, have been found to cause health issues, particularly to infants, and therefore nitrate should be controlled below the advised limits. The pH of water plays an important part in any process where low pH or acidic water leads to increased corrosion within a system. High TDS (Total Dissolved Solids) will cause streaks and spots on glass and windows. There are different solutions for treating various elements in water, each using a different process to achieve the desired result. 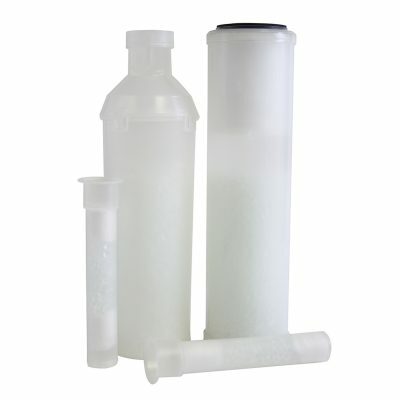 FDA compliant hexametaphosphate crystals dissolve to dose water systems, coating calcium and magnesium ions and pipework to prevent scale and corrosion. Available in 10" cartridges or as a cartridge insert (PCC-106).